Agriculture, farming, and fishing form the primary sector of industry of the Japanese economy, together with the Japanese mining industry, but together they account for only 1.3% of gross national product. Only 20% of Japan's land is suitable for cultivation, and the agricultural economy is highly subsidized. Agriculture, forestry, and fishing dominated the Japanese economy until the 1940s, but thereafter declined into relative unimportance (see Agriculture in the Empire of Japan). In the late 19th century (Meiji period), these sectors had accounted for more than 80% of employment. Employment in agriculture declined in the prewar period, but the sector was still the largest employer (about 50% of the work force) by the end of World War II. It was further declined to 23.5% in 1965, 11.9% in 1977, and to 7.2% in 1988. The importance of agriculture in the national economy later continued its rapid decline, with the share of net agricultural production in GNP finally reduced between 1975 and 1989 from 4.1% to 3% In the late 1980s, 85.5% of Japan's farmers were also engaged in occupations outside of farming, and most of these part-time farmers earned most of their income from nonfarming activities. The nation's forest resources, although abundant, have not been well developed to sustain a large lumber industry. 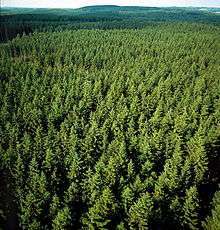 Of the 245,000 km² of forests, 198.000 km² are classified as active forests. Most often forestry is a part-time activity for farmers or small companies. About a third of all forests are owned by the government. Production is highest in Hokkaido and in Aomori, Iwate, Akita, Fukushima, Gifu, Miyazaki, and Kagoshima prefectures. Nearly 33.5 million cubic meters of roundwood were produced in 1986, of which 98% was destined for industrial uses. ↑ Iijima 2015, p. 1. ↑ Kakuchi, Suvendrini (26 June 2013). "Agriculture Leans on Japanese Women". Inter Press Service. Retrieved 9 November 2016.